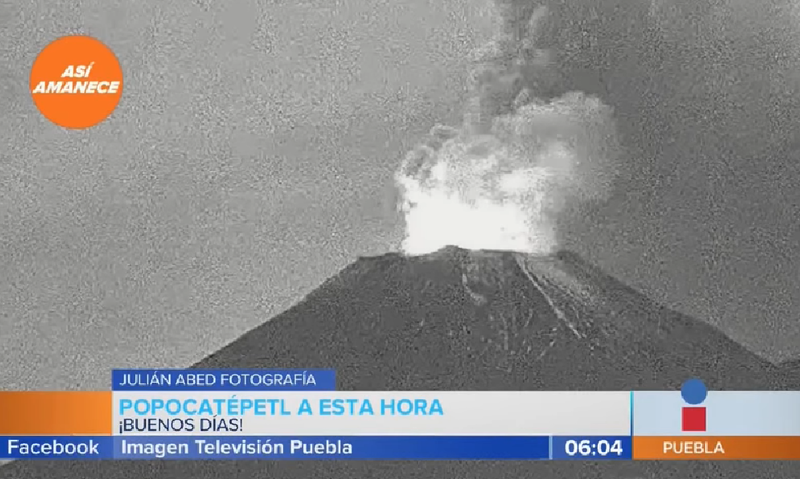 Officials confirmed Popocatepetl volcano belched into life again in the early hours of Monday, July 31. The 9,556km-high stratovolcano dominates the landscape in Central Mexico, lying about 69 kilometres (43 miles) from Mexico City. The volcano has a population of about 30 million people living within a 70km radius of its summit. Volcanic debris was pelted 400 metres skywards, while a column of ash and smoke could be seen rising two kilometres high. Luis Filipes, Mexico's civil defence chief, tweeted: "As a result of the Popocatepetl activity recorded this morning, we have reports of ash fall in Amecameca, Acuautla, Ecatzingo, Ozumba and Tepetlixpa." Residents were urged to remain out of a 12km exclusion zone put into operation around the mountainside. However, no evacuations outside of this zone are being carried out at the moment. Dr Carlos Valdes of the National Centre for Disaster Prevention shared a video on Twitter of the eruption at 3.10am local time. He later tweeted: "In addition to monitoring the Popocatepetl, which is now a bit active, the National Center for Disaster Prevention, is today with a group of technicians and researchers in the Tacana volcano, on the border of Mexico and Guatemala. "This is an important volcano and has a seismic network." Popocatepetl's warning level is currently sat at Amarillo, Phase Two. The alert means there is an increase in water vapour and gases. Ash and gas shot into the air for more than 24 hours and the government's Centro Nacional de Desastres (CENAPRED) urged people to stay well away. Activity at Popocatepetl's summit has increased since 1994 when people were sent scrambling during a violent eruption.